common. This is caused by human activity (sewage, chemical fertilizers, liquid manure, manure, etc). Limitation of sunlight supply to the lower parts of the pond and restrain of photosynthesis process is caused by accumulation of huge quantities of phytoplankton in upper parts of the reservoir. Decomposition of phytoplankton and metabolic products may be toxic and finally lead to decrease of oxygen dissolved in water. Generally is it associated with deterioration of water quality, its taste and smell values. Researches prove that metabolic poisons of cyanobacteria may be dangerous for people – can lead to various allergies, eczema as far as serious nerves damages. Algae are essential for proper functionality of garden reservoir. They produce oxygen and are lowest cell in food chain; only uncontrolled growth drops temporary hardness of water and causes fluctuation of pH value. Unfortunately most of available anti-algae agents don’t work in water with high pH values and are not effective in alkaline water (pH > 8.5°). If we limit those factors we limit amount of algae in our pond. Nitrogen compounds, phosphates and potassium are main source of algae nutritious witch arise in a result of decomposition of organics or are supplied in tap water. It’s very important to regularly clean the pond and use proper agents absorbing potential algae nutritious. The upset balance in the pond has important influence on algae growth. If temporary water hardness is over 5 and pH 8.3 water is stable and all substances contained in water (such as nitrite, nitrate, ammonia etc) are not harmful. Moreover activity of anti algae agents is limited in alkaline water (pH > 8.5). Fist of all it is necessary to check pH and CH (temporary hardness of water). It is recommended to run two tests, fist one in the morning (around 7am) and second in the afternoon (around 7pm). You can run the test using simple Soll testers, AquaCheck Soll suitcase or simply bring your water sample to the distribution point. To decrease pH you can use TeichFit or pH Minus depending on algae quantity in your pond. In case of large volume of algae in the pond TeichFit shouldn’t be applied because it may cause further mass growth of algae. In this case pH Minus is best choice; within 24 hours decreases pH to the optimum level (8°). However this agent doesn’t increase temporary hardness of water so it’s not sufficient to stabilize pH value. Due to this fact it is necessary to use stabilizing agent TeichFit but only when the volume of algae is reduced. In case of small volume of algae in the reservoir you may immediately apply TeichFit to decrease and stabilize pH. TeichFit® contains active CarbonAdd which optimizes and stabilizes main parameters of water: pH, temporary hardness and calcium content. Visible results may be observed just 3 days after use, variety of species and microorganism increase thus harmful substances eliminated. Moreover, TeichFit® immediately neutralizes heavy metals. 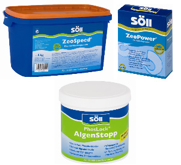 AlgoSol® fights against all kinds of algae (green algae, filamentous algae, flagellates) and if applied regularly effectively protect your pond against its growth. Active substances contained in AlgoSol® stop sunlight which is necessary for photosynthesis (SpectroSorp process) on one hand and from the other hand allow carrying out essential biological regulation process and metabolism. Algae are starved. This agent may be used at least 24hrs after or before using TeichFit. 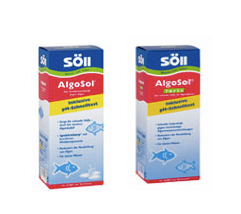 AlgoSol® forte works similar to AloSol® but contains much more condensation of active agent thus can only be used in case of large volume of algae. AlgoSol® then can be applied for prevention against further growth. PhosLock AlgenStopp® is strongest bonding agent in the world. Continuously reduces phosphate volume (main algae nutrition) to the level below 0,035mg/L thus reduces mass algae growth. It has to be used on a regular basis every 6 weeks. Caution: 1 kg of algae may arise from 0,1g of phosphates!!! Algae growing in a pond reduce its esthetical value. Their uncontrolled growth may lead to water bloom. Mass and long term water blooming is a result of eco balance disorder. Due to increased water fertility caused by greater supply of mineral and organic substances water blooming is getting more common. This is caused by human activity (sewage, chemical fertilizers, liquid manure, manure, etc). Limitation of sunlight supply to the lower parts of the pond and restrain of photosynthesis process is caused by accumulation of huge quantities of phytoplankton in upper parts of the reservoir. Decomposition of phytoplankton and metabolic products may be toxic and finally lead to decrease of dissolved in water oxygen. Generally is it associated with deterioration of water quality, its taste and smell values. Researches prove that metabolic poisons of cyanobacteria may be dangerous for people – can lead to various allergies, eczema as far as serious nerves damages. Algae are essential for proper functionality of garden reservoir. They produce oxygen and are lowest cell in food chain; only uncontrolled growth drops temporary hardness of water and causes fluctuation of pH value. Unfortunately most of available anti-algae agents don’t work in water with high pH values and are not effective in alkaline water (pH > 8.5°). The upset balance in the pond has important influence on algae growth. If temporary water hardness is over 5 and pH 8.3 water is stable and all substances contained in water (such as nitrite, nitrate, ammonia etc) are not harmful. Moreover activity of anti algae agents is limited in alkaline water (pH > 8.5). Fist of all it is necessary to check pH and CH (temporary hardness of water). It is recommended to run two tests, fist one in the morning (around 7am) and second in the afternoon (around 7pm). You can run the test using simple Soll testers, AquaCheck Soll suitcase or simply bring your water sample to the distributor point. If pH value is in range 7.4 – 8.4° and CH is over 5° it means that all parameters of water are correct -GO TO STEP 3. To decrease pH you can use pH Minus. In case of large volume of algae in the pond TeichFit shouldn’t be used because it may cause further mass growth of algae. In this case pH Minus is best choice; within 24 hours decreases pH to the optimum level (8°). However this agent doesn’t increase temporary hardness of water so it’s not sufficient to stabilize pH value. Due to this fact it is necessary to use stabilizing agent TeichFit but only when the volume of algae is reduced. Unfortunately most of filamentous algae killers is low effective, after usage is it sill necessary to hand remove remains as those may have negative influence on biotope. Moreover are very toxic. To remove filamentous algae we suggest using FadenalgenVernichter of Soll which contains active oxygen immediately eliminating filamentous algae and cyanobacteria. Additionally contains specific bacteria which decompose dead algae and improves quality of water; prevents from parasitic infection and fish diseases; doesn’t contain heavy metals, is transparent and quickly decomposes. Visible effects can be noted after 24hrs from use. FadenalgenVernichter of Soll in purely mineral agent, fully decomposable and doesn’t contain heavy metals. FadenalgenVernichter should be used regularly once a week (20g per each 1000l of water). During the algae elimination process, their remains becomes biological substances and also nutritious for other algae. So at the same time you can remove some algae and makes other grow – usually filamentous algae. To avoid that next step should be absorption of biological substances contained in water and algae remains. To do so it is necessary to use agents reducing algae nutritious – phosphates and nitrites – such as pure zeolite – ZeoSpeed and phosphate bonding PhosLock AlgenStopp®. It’s really important to stabilize pH value; its growth minimizes effectiveness of preventive agents and may cause re-appearance of algae and destabilization of the whole reservoir.